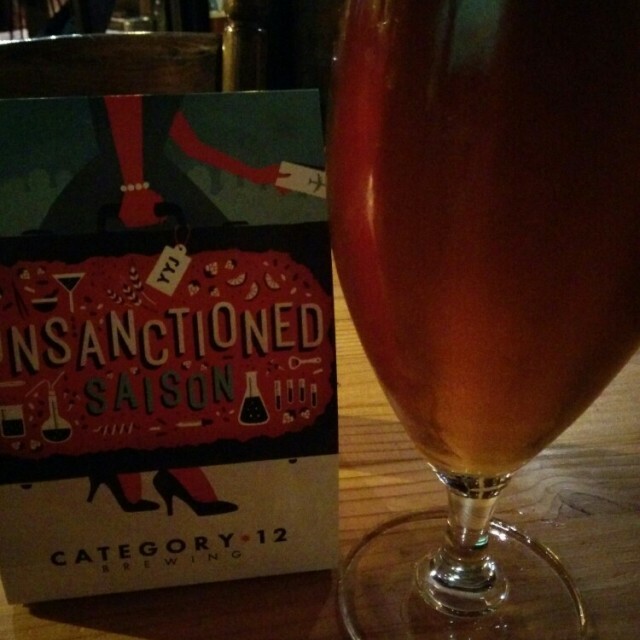 Most of us have heard rumblings of this new brewery in town called Category 12. They are on Keating Cross Road with a little tasting room and growler fill station. You can read all about them in Eat Magazine. There are currently two beers available, a saison and a black IPA. You can find kegs around Victoria, including this cool place called The Drake. So how do they taste? It started off great. There was a slight spiciness that came from both hop and yeast. You could also detect a funky earth aroma with ginger. It was surprisingly hoppy with more of that spicy floral and earthiness. The malts got a little funny, perhaps a bit underattenuated. It tasted grainy, mushy and chewy, not crisp and dry as expected. Perhaps I was hoping for local Saison Dupont. Still, I would order another. Glassware: Something clean. I would use a pokal tulip. Food Pairings: Cheese would be a wash rind goat. Something light and spicy would go well. Perhaps lamb chops with a mildly spicy pepper glaze. I was getting a little worried until I tasted the Black IPA. This dark brew hits all the marks. A grapefruit citrus and piney hop aroma can be smelled one table over. 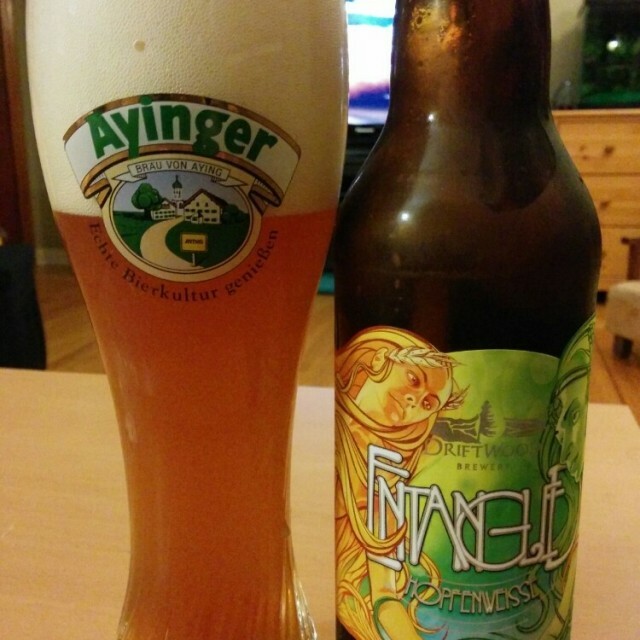 It has a griping astringency that is partially kilned malts and partially hops. Imagine what a black IPA should taste like and this is it. Balanced parts of bittersweet chocolate, espresso, over done toast with marmalade and sweet grapefruit rind. Not over the top, but just right. Glassware: A nice, big pint glass thank you. Food Pairings: Something bold and roasted. A grilled portobello mushroom burger with blue cheese. As for the cheese, make it a well aged cheddar. People, I have finally hit it big time. This is a commissioned/requested beer review. Before you get all excited and start blogging for free beer and fame, you might want to learn the reality. I had to buy half the beer for this posting and my payment might be a pint. Still, it is nice to be noticed. Anyone who has frequented any place that sells beer has probably seen a bottle from Barkerville Brewing. They have super pretty bottles and prominent placing. The beers have been getting some good reviews, ask my friend Chuck. Barkerville seems to be following the standard formula: make a blonde, make a pale, make a brown and make an IPA (English). But what I'm talking about is the stout. Enough of my ramblings how does the 52 Foot Stout taste? It's a good stout, one the best in BC. I'm not just saying that because I've been commissioned; it's good. The nose hits all the marks, roasted coffee beans, dry cocoa and light berries. 52 Stout has a slight cola astringency with a medium mouthfeel. There is a notable presence of Mexican drinking chocolate dryness, mixed with assertive roasted pencils, old coffee and blackberries. Sadly, this all fades away too quickly. Glassware: A snifter or pint will be. Just make sure it is clean: Brian is watching. Food Pairings: Would do well with a meaty, roasted dish or even dessert. Imagine the 52 Stout with tiramisu. Cheese: Let the roasted character mingle with a smoked Gouda for fun. I was also asked to determine if this beer might cellar. This is a tough one as the other beer provided was only 6 months old and storage was not controlled. There are many things determine if a beer will age well. Most notable with the 52 Stout are: alcohol content is a little low (7%), beta acid content of hops is OK, malt complexity is good and will prominent roasted flavour morph into something new. Will this beer change over time? Most certainly yes, even just six months of aging produced a noticeable reduction in the roasted aroma and flavour. With this diminished roast more syrupy wood and berry flavours came forward.Will this beer improve? Hard to tell, this is personal thing. I quite enjoyed the roasted character, so aging this beer might not appeal to me. However, if you are bittersweet chocolate and berry person, this might be something you might want to put away. Maybe I will put a few in the back for fun.